John Quiggin has a post Climate change and catastrophe wherein he links to his article in The Economist Why the Paris conference may not be enough. I know from the WordPress software that people are slack in following links, so I’ll try to give a sense of what he said. As “sceptical” positions about climate change have crumbled, “lukewarmers” are saying that unmitigated global warming would not be so bad after all, that adaptation is the best response. Action to mitigate climate change will harm the world more than the economic impact of climate change itself. If global warming is held to 2°C, the current international goal, adverse effects will be localised and relatively modest. Warming of 4°C would change the world radically, with widespread species extinction and severe effects on agriculture and human health. And 6°C or more would be a catastrophe, threatening the end of human civilisation. The IPCC suggests that a doubling of CO2 has about a 5% chance of putting us in the 6°C zone. Policy needs to take account of these “low-probability extreme events”. even a 450 ppm target is not, as is sometimes suggested, “safe”. Policymakers need to be alert for signs that climate change is greater than expected. If such signs appear, it will be necessary to accelerate efforts to decarbonise the economy more rapidly, and ultimately to remove carbon dioxide from the atmosphere through reafforestation, aiming at a lower target such as 350 ppm. Please note that the graphs do not include slow feedbacks. Secondly, I think the appropriateness of two degrees should be called into question in relation to a safe climate. See my post The folly of two degrees. 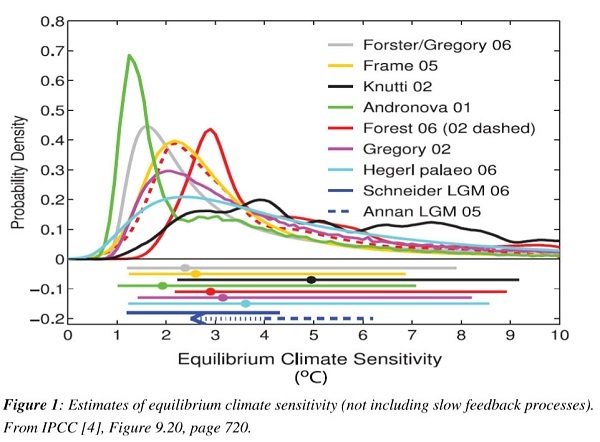 The straight lines pinpoint about 425 ppm as associated with a 66% chance of staying within 2°C. Please note that the x-axis is calibrated in terms of ‘carbon dioxide equivalent‘, a measure that includes the six Kyoto greenhouse gases, such as methane and nitrous oxide. Last I heard we were at 480 ppm CO2e. Time to get on our bike! If we wait for “signs that climate change is greater than expected” it will be too late. Hope you bring back lots of observations and handy hints on climate change and how we can take advantage of it. From that point of view the trip was pretty much a failure. Yes we saw wind farms and solar panels, some very large solar farms, but nothing worth writing about. But of course that was not why I went there. It would have been a bonus.